WELCOME, I RIDE A DS 650 BOMBARDIER ATV. On this site I will talk about my bike and my wife's bike and maybe some riding buddies' bikes. We live in eastern KY and ride some trails and pipe lines. Sometimes we go on a trip farther off to try different places. 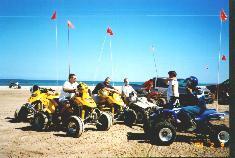 We've been to Silver Lakes in Michigan,Little Sahara Sand Dunes in Oklahoma,and Glamis sand dunes in CA. We're planning a trip to the Badlands in IN. this summer. WE TOOK A TRIP TO SILVER LAKE, MI. ON THE 3RD - 5TH. WE HAD A GOOD TIME . THE PLACE IS NOT THAT BIG(450 ACRES) BUT IT IS CLOSER THAN GLAMIS.WE'RE PLANNING A TRIP BACK TO GLAMIS AT THANKSGIVING, A FEW OF OUR NEW FRIENDS FROM SILVER LAKE MAY GO TOO. GLAMIS IS THE ULTIMATE!!!!! !